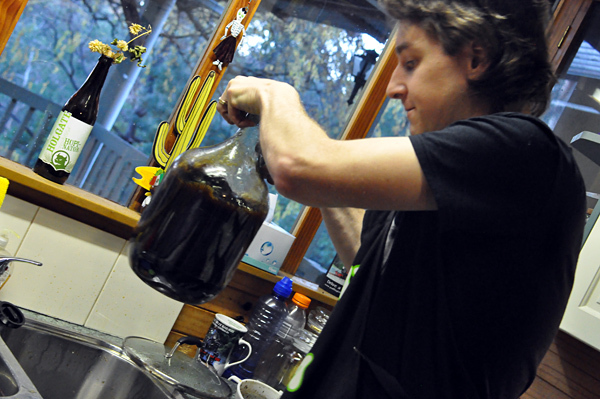 Continuing on with the home brewing adventures, our fourth brew was a chocolate porter using BrewSmith. With thanks to the owners of this new Aussie homebrew business, a sample BrewSmith kit arrived on our doorstep back in May, providing the opportunity to trial another method of home brewing – the partial mash. The box included their Chocolate Paradise Porter ingredients, which meant we would be brewing our first dark ale. Appropriately, we brewed this dark beer the year’s darkest day, Winter Solstice. Our brew-day music was the The Lost Boys soundtrack on vinyl. Displaying the tag-line “beer made better”, BrewSmith is a micro homebrew kit designed to offer a significant step up from other basic kits that you’ll find in department stores like K-Mart, Target and Big W, such as the ghastly Mr Beer or the plastic-fantastic Coopers DIY Beer kit. 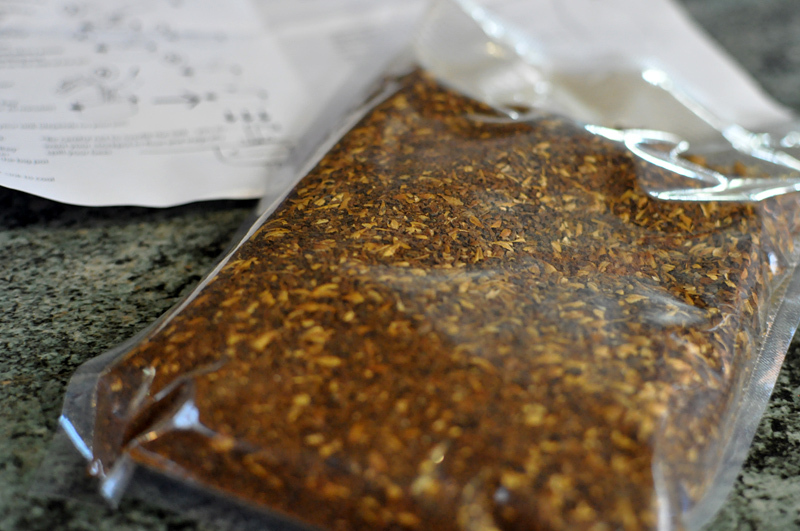 Those kits essentially encourage boring extract brewing using cheap ingredients, and require little more than the addition of water and yeast. For around the same price, BrewSmith ($70 for the starter kit, compared to $40-90 for the others mentioned above) takes you a step closer to genuine brewing by providing milled grain and actual hop pellets for crafting a higher quality beer within the confines of a small space. The use of a partial mash and staged hop additions can add a complexity and freshness that will give homebrew real craft beer character. Primarily targeted to new home brewers who have little room at home, the kit produces a batch of around 4 litres, enough beer to fill two six-packs of 330ml bottles. If you’re initially eager to brew more than that, and have the kitchen space for large brewing pots as well as storage space for crates of bottles, you may be best off sticking with the traditional 30 litre fermenter tub that any homebrew shop will sell you. However, as we quickly discovered with our previous brews using the standard 30 litre fermenter, brewing 23 litres of novice beer for two people means that you have to drink 23 litres of that beer. If the brew goes bad or it’s not exactly your type of session beer, you’ll find yourself left with a lot of wastage and/or bad drinking to endure. Hence, producing only 4 litres at a time was very appealing to us… until we learn to brew fully awesome beer every time. 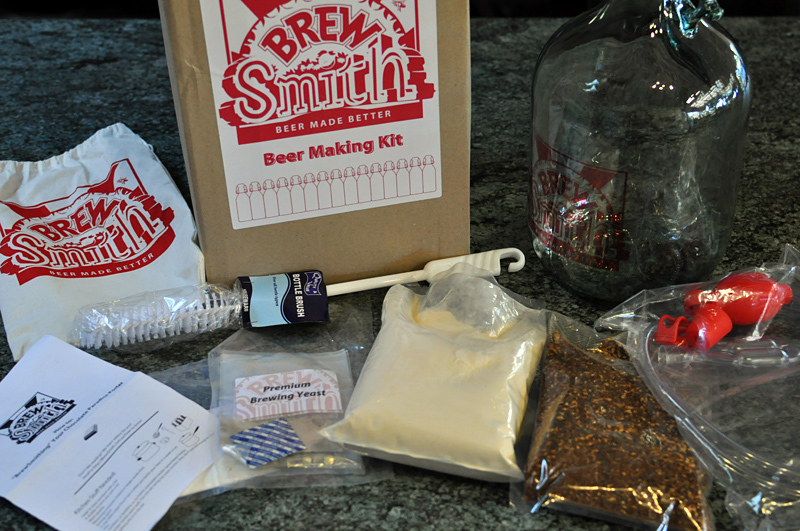 The first thing you notice with the BrewSmith kit is the ease of how to start. Everything you need is provided and the instructions are clear, complete and easy to follow. There are also instructional YouTube videos and other supporting information on the BrewSmith website and blog. If we’ve had a frustration with our homebrews to date, it’s been from the lack of sufficient instructions provided with the kit or recipe. Our exposure to commercial brewing over the past several years has already taught us a fair amount about brewing processes, so we often found ourselves asking “how”, “when”, “where” and “with what” when we saw holes in the process or when something didn’t go to plan. We would fill in gaps by referring to homebrew texts or using Twitter to ask questions. There was no need for this with BrewSmith. Along with the straightforward instructions, all items in the kit are clearly labelled or identifiable. The only items you need to add yourself will be readily found in almost every kitchen, including a large (5 litre) stockpot, a small (2 litre) pot, a measuring container and a strainer. The BrewSmith process works through timing steps. It does not require measurements of temperature or readings of gravity, so it’s important to have a timer, or a decent clock and a notepad, close by to keep track of your timings. 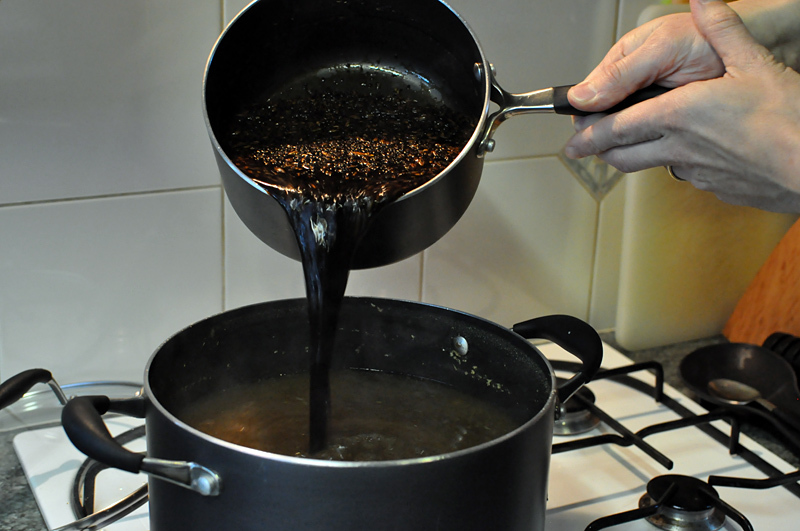 To start, you simply boil water in the two pots, then add the dry extract malt to the large pot and the specialty grain (in this case, chocolate malt) to the small pot. Hops are added to the extract malt throughout the boil. 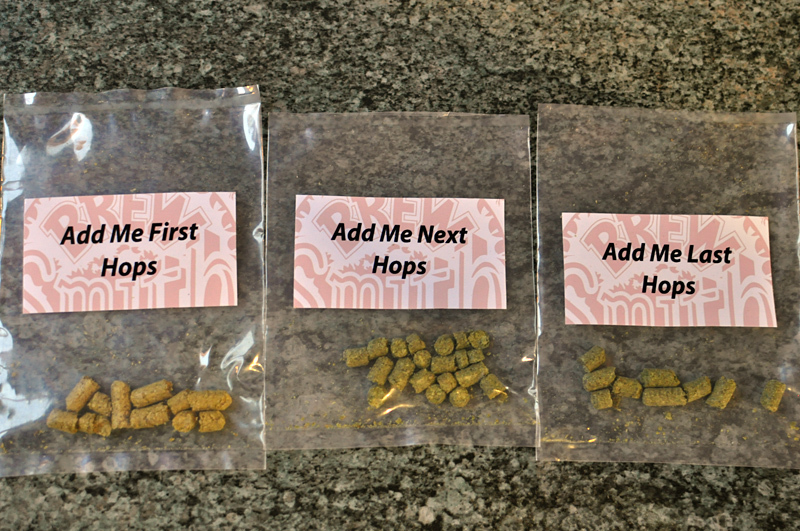 Three packets of hops are provided, marked with “Add Me First”, “Add Me Next” and “Add Me Last”. No information is provided about what variety of hops they are or why they are used, which I assume is to protect the BrewSmith recipe and encourage you to continue buying their supplies. The only hiccup of our BrewSmith experience was when it came time to pour the small pot of chocolate malt into the large pot of extract. Watch out, this can get messy and sticky! 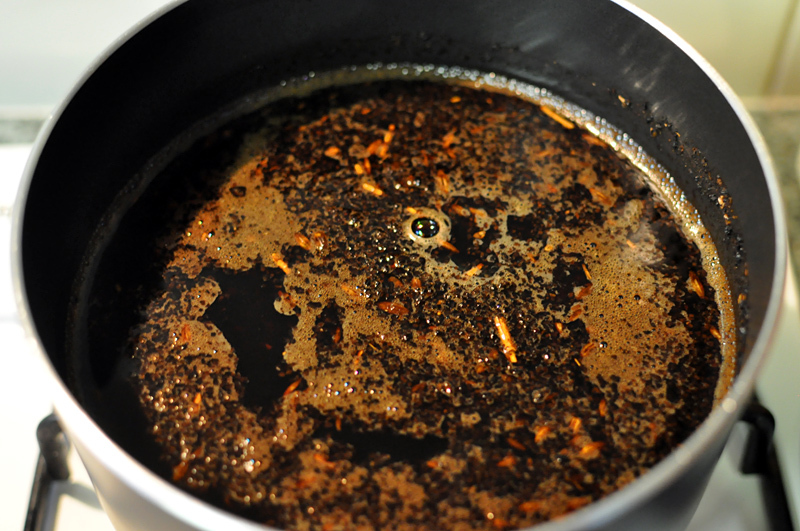 There was a great deal of hot splatter from the lumpy grains slopping into the extract. Two litres of steeped grains is actually relatively heavy in a small singled-handled pot, so it was tricky to do smoothly, and we lost of bit of it on the stove top and the wall (which also required a fair amount of elbow grease to clean off if it is allowed to dry). Nonetheless, it was a small mess in the fun of brewing. A rookie mishap that we’ll surely iron out next time. We managed to get most of the cooled wort into the fermenter, added the yeast and gave it a good shaking. The instructions don’t mention sanitising the hand you use to cover the fermenter’s opening as you shake it up, but I suggest it’s a good idea to do so (…it’s the little things that can make a big difference in the end results). The whole process took us less than two hours and by the next morning the beer was bubbling away nicely with fermentation. Two weeks later the porter was ready to be bottled. The BrewSmith kit comes with a tube and hand pump to siphon the beer out of the fermenter and into the bottles. It’s a more tricky and involved method than using a tap on the bottom of a plastic fermenter tub, but it got the job done, after an initial explosion of more beer onto the wall because the tube burst out of the stopper when we were pumping to begin the siphon. Most importantly, how did the beer turn out? After three weeks conditioning, the result was a very tasty and full porter, which could possibly pass as a commercially or professionally brewed beer. In the past I have tasted many porters that seemed more like dark ales, but this one definitely reflected the true porter style. The chocolate flavour is very subtle, with a roasted malt character dominating. However, as the beer warms, choc-peppermint notes come through in the back of the mouth. The length of flavour is great and it has a nice rounded smoothness unlike any of our previous homebrew attempts. It’s practically sessionalable! The BrewSmith team has also noted that they are developing an imperial version of this porter, which will strength the chocolate character, as they work on expanding their recipe range. 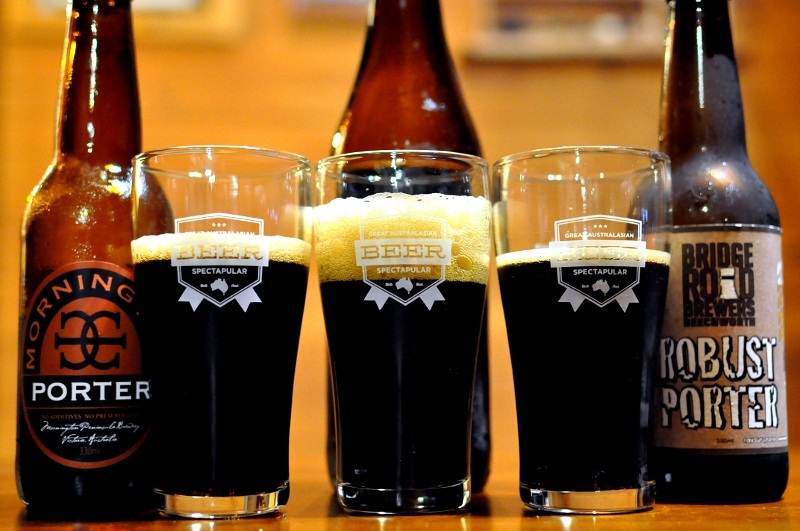 We put our BrewSmith porter to the test, tasting it against two of Victoria’s best porters – the Bridge Road Brewers Robust Porter and Mornington Peninsula Brewery’s Porter, truly excellent beers that we’ve enjoyed many times before. This placed the bar very high, even by commercial brewing standards, but I was hoping to amplify any differences. The delicious silky body and chocolate flavour of Mornington’s Porter easily won in this line up, closely followed by the always dependable Bridge Road Robust Porter with its smooth roasty texture. Even so, BrewSmith provided a respectable and enjoyable porter, more closely aligned to the roasted and mocha flavours of the Bridge Road porter. It’s by far the best beer we have brewed so far. Sure, rich dark beers (like this chocolate porter) are forgiving styles when it comes to home brewing. With robust roasty and chocolate characteristics dominating, any imbalances in hop profile, carbonation and mouthfeel will generally be harder to detect for the novice. Would the result have been as if we tried the Blonde Ale or Wheat beer? Based on this good result, I’ll order the Hoppy Heart IPA for my next BrewSmith brew, and hopefully then discover if a more complex beer to balance, like a big and hoppy India Pale Ale, comes out just as well. The other recipes currently offered in the BrewSmith range are a blonde ale, a honey wheat beer, and the new Aussie Wattle Pale Ale. The BrewSmith service doesn’t cater directly to people wanting to create or adapt their own recipes and styles, but if that’s your aim, there are plenty of homebrewing books and online resources for self-education to develop the required know-how. The methods and processes of BrewSmith are nothing new. The overall package offers its point of difference by providing quality ingredients of malt, grain and hops in a neat and compact setup with a wealth of online supporting material. For people new to homebrewing, the technical side can be intimidating and overwhelming when learning how to use grains and hops effectively. BrewSmith eliminates these elements and allows the user to learn the basic process of brewing first. For those seeking to tackle the science of brewing, BrewSmith skips the measurements, readings and adjustments of brewing that may lead to improving the efficiency of your brew or learning how to create your own recipes. However, that’s for advanced home brewing. Ultimately, if you’re simply happy with following a set design to craft a flavoursome beer, BrewSmith is for you. 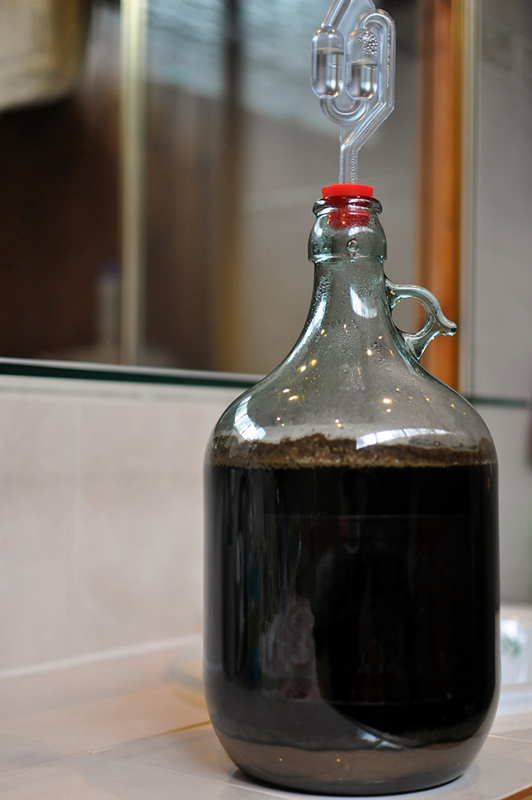 Overall, BrewSmith is a great starting point for anyone remotely interested in home brewing. It’s a fun, well organised and wisely thought-out package that brings the flavour of basic home brewing into the modern craft beer era. To buy BrewSmith gear, simply visit the online store or check out their list of stockists. Proactive on social media, the BrewSmith team can also be found on Twitter and Facebook. 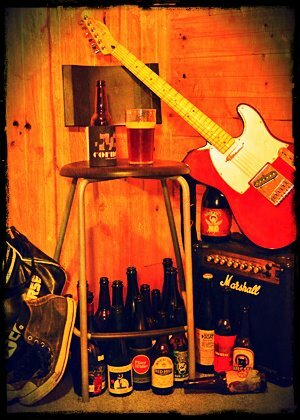 For more pictures from our BrewSmithing, check out the Beer Bar Band Tumblr feed. 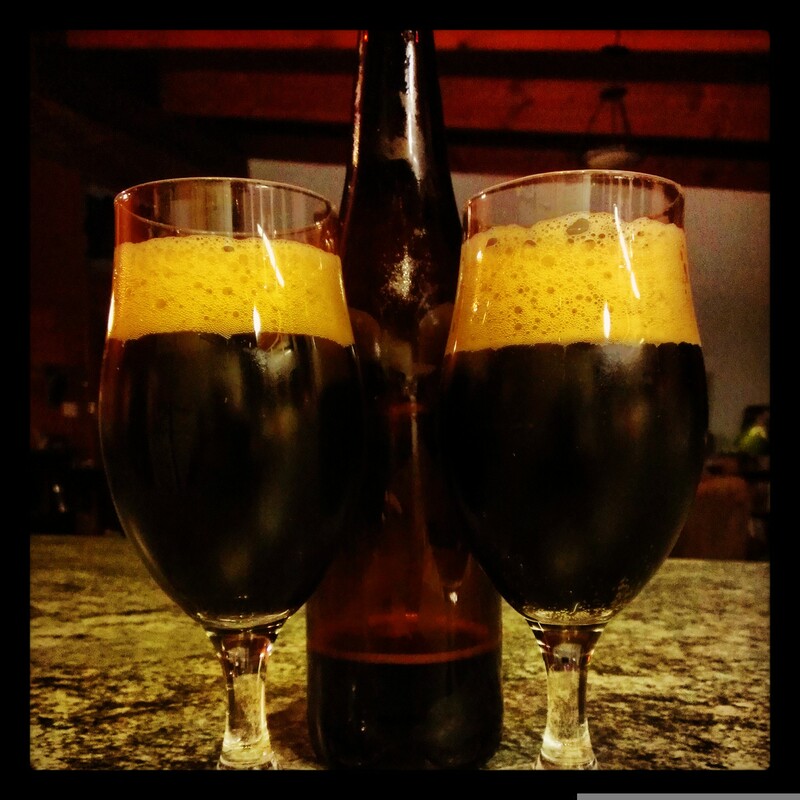 Tags: BrewSmith, homebrew. Bookmark the permalink. did i read that as you “boiled” the grains? haha, oops, yeah…my bad. I originally wrote something else there, then changed it to be about the chocolate malt but didn’t changed the boiled referenced. Cheers.